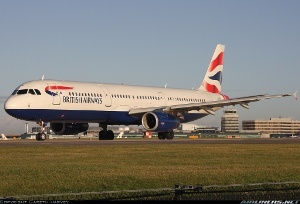 Some time ago, Travelodge were running a hotel sale, rooms for £9, so after discussion with my wife I'd arranged to spend a night at the Heathrow Central Travelodge, to go an see some planes. A friend had booked another room, for him and his 2 year old boy, to come as well, but it turns out that he'd double booked himself and so couldn't come. I'd looked into travel options, and thought that it would be fun to try and fly at least one way from my home in Norwich, and maybe notch up another couple of firsts. I found a bargain fare on BA from LHR to Manchester, which gave a few hours before the evening BE flight MAN - NWI (at £0 plus taxes). Getting to London proved trickier, as we'd planned to go in my friend's car, but given that it was a Sunday there was engineering work on the railway. This had the bonus of giving some relatively cheap fares booked only a few days in advance, as most rail websites directed traffic from Norwich to London via Cambridge, which doesn't offer any book-in-advance fares. Oddly, the standard class fare ended up at £14, whilst 1st class was £10.70! However, the journey took twice as long as it should, as there were two separate bus legs and an additional tube journey. Bus Norwich to Stowmarket, then join the train to Ingatestone, where another fleet of busses took us to Newbury Park tube for the train into London. After all this pfaff I eventually made it to Liverpool St, where I'd arranged to meet up with an old university friend for a few pints. He's working in London and a bit of a musician, and is part of a group with a free download EP out - http://www.invulnerable.co.uk/ Check it out After a good catch up, he headed on a bus back to Greenwich and I to the tube for Heathrow. I got off the tube at Hounslow West and walked to the Travelodge along Bath Rd. It wasn't too far but would require the bus with luggage. Fortunately, I was given a room on the 5th floor at the back, with a view over the (distant) runway. As it was late, there wasn't much traffic at this time. I made a cup of tea and went to bed. The following morning, I checked out and headed along Bath Rd towards the airport. I stopped for breakfast at the McDonalds opposite the Rennaissance, and went over to the viewing terrace in front of the Academy. Unfortunately, I'd forgotten our big DSLR camera, so only had my old phone camera, but took a few pics of some heavies taking off just metres in front of me. Occasionally, 27R, which mostly had takeoffs, would halt to allow a BMI narrowbody to land - any idea why they didn't land on 27L like everyone else? After a while I headed to the bus stop on Bath Rd to take a bus to T5. The first bus that came was only going to the central bus station, so I took it and transferred to the Heathrow Express to T5. Up to departures to check in, I used a machine. The only details it asked for was my Executive Club card - after inserting this, I was checked in and advised to go through security. Bizarrely, it said that my ticket class was "C", even though it was a discount Y ticket - any ideas? (I did wonder if it was an upgrade, and asked at the entrance to the lounge, but alas no). I now had a couple of hours airside at T5, so wandered around, took some more pics and watched traffic. Eventually we were called for boarding 10 minutes later than scheduled departure time. I wasn't worried as I had allowed over 3 hours in Manchester. After loading, we pushed back, and started the long taxi to the other end of the airport to take off. It seemed like there were some queue jumpers just before our turn to take off! Captain warned us that there was likely to be some turbulance due to low cloud cover, but would be clear after that. We took off, and turned to the right. There wasn't really much turbulance at all. The cabin crew then started the service. I though that BA would offer a sandwich or something similar given that it was lunchtime, but no - we were offered a drink (I took apple juice) and either a sweet (cookie) or savoury (bag of dried friut and croutons) snack. I took the savoury. The video screens showed the map channel throughout the flight, so we could see our quick progress up the country. Looking out of the window on descent, I had a magnificent view of the Peak District, sorry no pictures as I only had my phone and of course it was switched off. It seemed that we were very low over the mountains, as the land dropped off and the airport was much lower. We touched down and came to a stop at a gate in T3. My next flight also departed from T3, so I decided to check in straight away, again from a machine. This one also gave me the option of picking a seat (I hadn't done this on booking, as it is chargeable on BE) and printed out a card boarding pass. I then went to look around. I remember from years ago that there was a landside food court area overlooking the apron, but it seems now that this has been shifted to airside, so there is nowhere warm and comfortable to view traffic I walked down to T1 and T2, but there was nothing noteworthy, except to note that both terminals seemed deserted. I went to the station as well, to check the price of a train ticket should there be a problem with the flight - £75 to Norwich one way, over double what the flight cost! As there was nothing doing anywhere, and I didn't have time to go to the viewing area with the Concorde (it was getting dark by now anyway) I headed for security. I was quickly airside and found a small selection of shops. I bought a sandwich meal from Boots (probably the best value food there is in airports these days) and sat by a window to eat. I read some of my book (Botswana Time by William Randall, highly recommended!) as they don't indicate which gate each flight is using until 30 mins before departure. The flight was called, and we boarded by stars. I was sitting under the wing, next to the engine. As it was dark, there wouldn't have been much of a view anyway. Unlike the Fokker 50 whose overhead lockers are tiny under the wing, the Dash 8's lockers remained full size the length of the cabin. The first officer came on the tannoy to report an ontime departure and arrival, that it was lightly raining in Norwich and to expect some turbulance (again). Takeoff was uneventful, the service onboard was BOB - I didn't buy anything, I'd be home in less than an hour! The flight was calm, until we started the descent (not much of one as the earlier announcement said we'd cruise at 12,000ft). Then you could feel the movement, and the buffeting from side to side. 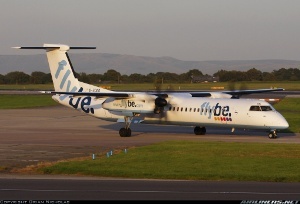 I was reminded of the SAS Dash 8 fleet, grounded after collapsing undercarriage, but we were ok. Landed and braked sharply on NWI's short runway, and taxied to the terminal. From deboarding to kerbside in 5 minutes, I then walked home, it only took 35 minutes which was quick for a journey on foot! Overall, a good couple of days with planes and friends, but good to be back to my wife and baby!